Quinoa is one of the most versatile grains and it’s now widely available in store. It’s a slow-digesting carbohydrate source that is also a good source of protein and fibre. 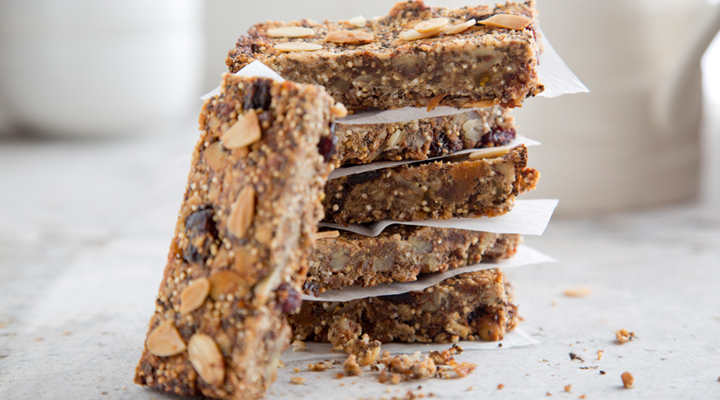 Quinoa is easily flavoured and is a great option to include in breakfast, lunch or in snack bars like these. 1. Preheat the oven to 180°C/gas mark 4. Line a 20cm square baking pan with non-stick baking paper to prevent the bars from sticking to the edges. 2. Mix together the oats, uncooked quinoa, chia seeds, cinnamon and salt in a large bowl, then stir in the mashed bananas and vanilla extract. Add the almonds, pecans and dried fruit and mix again. 3. Place a small saucepan over a low heat, then add the nut butter and honey and stir until warm and the nut butter and honey have melted together into a paste. Pour this paste over the dry ingredients and mix together until well combined. 4. Pour into the lined pan and press down firmly. Bake for 25 minutes,until the edges have turned golden brown. Allow to cool on a wire rack before cutting into bars or squares.